Pickleball and Canadian French Fries and Gravy? Well, I didn’t exactly eat that popular Canadian food pairing, but I did get a good taste of what pickleball in Canada is all about. 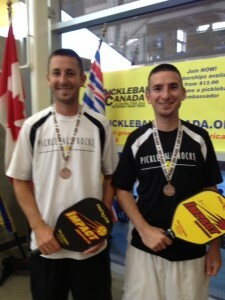 My brother, Josh, my dad Rocket, and I all played in the 2013 Canada National Pickleball Championships this past week. We had an absolute blast. We flew in to Seattle a day ahead of time to get some practice in with “Yoda” (Mark Friedenberg) and Scott Lennan. What a treat! We got schooled quite a few times, and did a little teaching ourselves! After an easy day of travel up to Abbotsford, British Columbia (just over the border), Josh and I took aim at the open men’s doubles division. We got out to a strong start, winning a couple of matches, and then we got steamrolled by the really good team of Denis Zhekhovskiy and Scott Lennan. We won another couple of matches in the losers bracket, then ran in to them again in the bronze medal match. We made this one a dogfight, but they came out on top to go to the gold medal match, before eventually falling to Billy Jacobson and Chris Miller. So we settled for bronze, but we were thrilled to be up on the medal stand, especially ahead of some other VERY good teams. Day two of the tournament was men’s open singles for me. I played pretty well all day, and ended up finishing 4th out of the 19 registrants. Again, I was thrilled to be up that high at the finish, but we all think about those 1 or 2 points that could have gone the other way and changed a match. It would have been great to medal in both events I was in, but singles will just have to wait until next year! All in all, we had a great time all weekend. 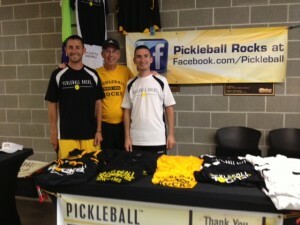 The people were awesome, the play was very high level, and people loved our “Pickleball Rocks” shirts. Can’t ask for much more than that. The only thing I would change, the next time I’m in Canada, is when the restaurant server asks if I want gravy with my fries, I will have to take them up on that. Thanks Canada for a great tournament! 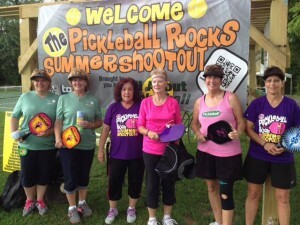 1st Pickleball Rocks Summer Shootout a Hit! If you can imagine a 4 person game of ping pong, being played while standing on top of a really big outdoor table, then you have pickleball. 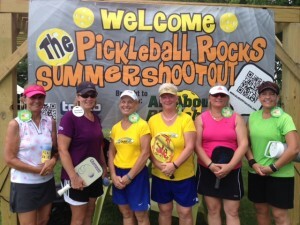 Now create a day for a whole bunch of them to compete for one-of-a-kind bag tags and really cool prizes, then you have the Pickleball Rocks Summer Shootout in Brookville, Indiana. A tour around the tournament site revealed a huge hospitality tent loaded with snacks and bottled water that was sponsored by various local businesses to make sure the players were kept strong and hydrated. Also courtside was a newly built shade shelter with plenty of seating to help keep the players cool. 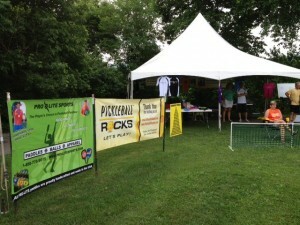 And of course, one of the most popular places to hangout between matches was the vendor tent showcasing the wildly popular “Pickleball Rocks” dri-fit shirts and hats plus corporate sponsor, Pro-Lite Sports pickleball paddles. 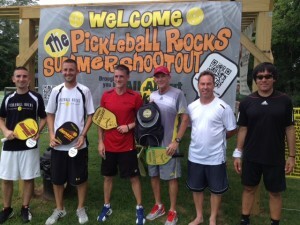 If player feedback is any indicator, the 1st ever Pickleball Rocks Summer Shootout was a huge success. Said tournament advisor Rodney Grubbs, “It was certainly fun planning this first ever Brookville tournament, but what was most satisfying for me is that I sit on the Chamber of Commerce board of directors and this tournament put people in our hotels, restaurants and bed and breakfasts for two weekends. From a tourism standpoint this tournament was a great success and it will only grow from here. From a pickleball growth point of view, it is phenomenal to have this many players come here for a first time tournament. Obviously people are hearing about the quality of pickleball being played here in Brookville. Saturday June 29th was a special day just for the 3.0 skill level players competing for the coveted “Shootout Champion” bag tags and “Pickleball Rocks” branded prizes. The ladies 3.0 winners were: KeKai Ruckstuhl and Jean Haupt from Chattanooga, Tennessee. Runnerups were the sister duo of Shelly and Tammy Haley of Indianapolis and third place went to Sharri Kendall and Betty Herbert of Connersville. On the men’s side, bringing home the top prize was: Matt Klein and Joe Meeks from Fort Wayne, IN. Runnerups were Paul Hamilton and Larry Oliver from Anderson Township, OH and third place went to local Brookville players, Michael Taylor and Kevin Moster. Sunday June 30th was dedicated to the 3.5 level players and the ladie’s winners were: Melissa Muha (Fishers, IN) and Karen Grubbs (Brookville, IN). Runnerups were Jen Griffin (St. Leon) and Bridget Danemayer (Cincinnati, OH). Third place honors went to Kim Clements (Cincinnati, OH) and Kathy O’Bryan (Brookville, IN). 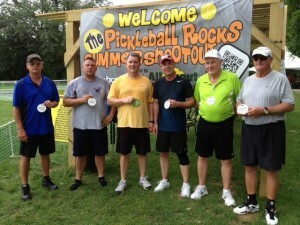 Men’s 3.5 tournament winners at the 2013 Pickleball Rocks Summer Shootout in Brookville. 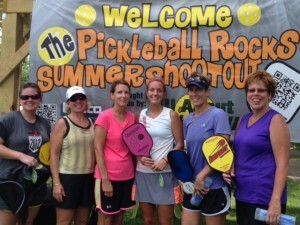 The 4.0 Ladies Winners at the 2013 Pickleball Rocks Summer Shootout tournament. 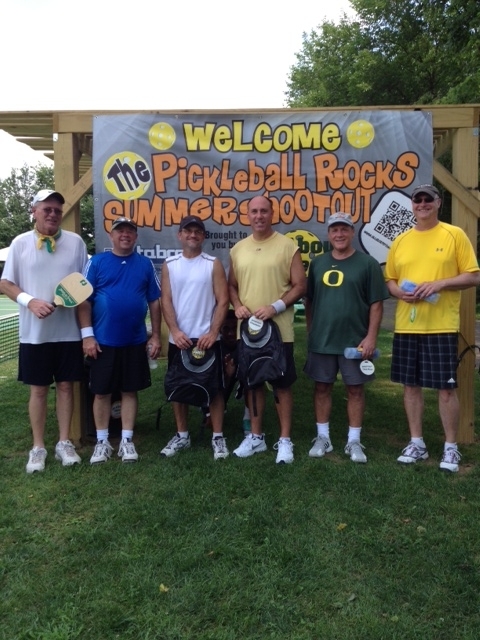 5.0 Men’s winners at the 2013 Pickleball Rocks Summer Shootout tournament. 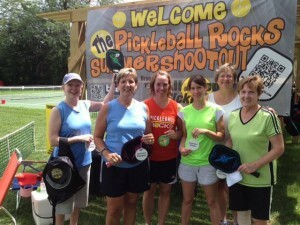 The 5.0 Ladies Winners at the 2013 Pickleball Rocks Summer Shootout tournament. Men bringing home the prizes consisted of: (CHAMPIONS) Bruce Colton (West Chester, OH) and David Newman (Anderson Township, OH), (RUNNERUPS) Rick Zeek (Western Hills, OH) and Marc Mateyko (North Bend, OH). And capturing third place by the slimmest of margins (1 point) was the team of Jerry Rea (Syracuse, IN) and Ken Flora (Fort Wayne, IN). On July 20th the 4.0 players gathered for their special shootout. Coming away with the prizes for the men were: (CHAMPIONS) Mark Oswald (Fort Wayne, IN) and Don Labacz (Grabill, IN), (RUNNERUPS) Brad Bilyeu (Terre Haute, IN) and John Tackett (Louisville, KY) plus 3rd place finishers, Dave Brostrom (Cincinnati, OH) and Jim Huitsing (Mason, OH). Lady winners were: (CHAMPIONS) Marilyn and Courtney Haslup (Fort Wayne, IN), (RUNNERUPS) Miriam Long and Chrissy Haywood (Louisville, KY) and 3rd placers, the dynamic sister duo of Sharon Hall and Cheryl Wyatt (Middletown, OH). In the sport of pickleball, there are not many players who are entitled to the coveted 5.0 skill level designation. But on July 21st, 2013, sparks flew as some of the best 5.0 pickleball players in the country descended on the sleepy little town of Brookville. After a full day of competition, the prize winning 5.0 winners for the men were: (CHAMPIONS) Jim Hackenberg (Kalamazoo, MI) and Paul Sprainitis (Clinton Township, MI), (RUNNERUPS) Josh and Zack Grubbs (Fort Wayne, IN) and bronze medalists JT Schulze and Mike “Ripit” Schwartz (Florence, KY). At the end of each day a prize drawing was done to give away a Pro-Lite Paddle. The lucky winners were Gene Silver who won a Pro-Lite Blaster, Jan Eischens who won a Pro-Lite Magnum, Robbie McClain winning a Pro-Lite Classic and Marsha Koch taking home a Pro-Lite Aero-D. Many thanks to sponsor Pro-Lite for donating the paddles. 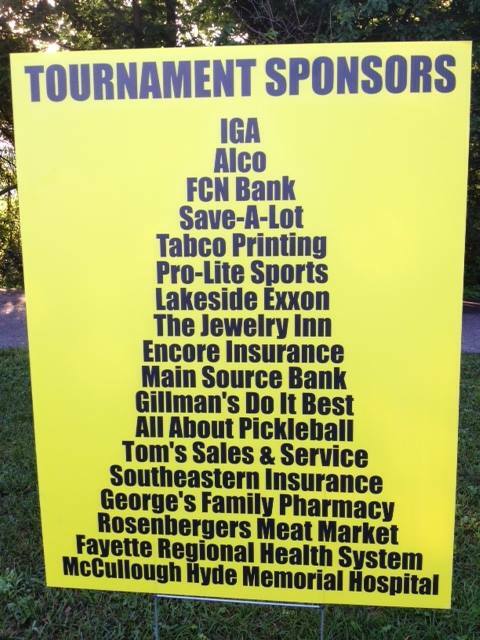 And of course, a tournament of this magnitude simply cannot happen with the support of our great local sponsors. Thanks to everyone who pitched in. 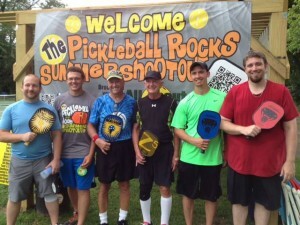 “This was our first Pickleball Tournament and we had a great time. It was so much fun, can’t wait to do it again next year!!!! !” -Betty H and Sharri K.
“Had a great time on Saturday. Thanks for the amazing event!! !” -Michael T.
“Thanks again for the opportunity to play in your tournament. It was a great time. Well organized. I have played in other tournaments that were not well organized at all. My partner and I both enjoyed ourselves a lot.” – Larry O. “Tournament was a lot of fun. You all did a great job with everything.” – Judy G.
“Loved your tournament. 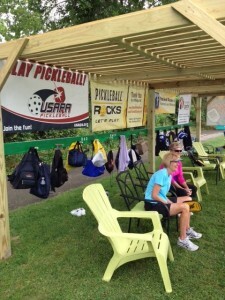 Tell the boys thanks so much.” – Michell C.
“My first pickleball tournament and I loved it. Thanks for a great experience.” – Jen G.
“A Five Star tournament. Smoothly run and plenty of fun playing pickleball. Looking forward to next year.” – Miriam L.
Additional sponsors were: Harold Spurlock (Local Farm Bureau Insurance Agent).